Durable continuous filament Nylon yarn tufted to an ultra-dense 20 oz. per yd. 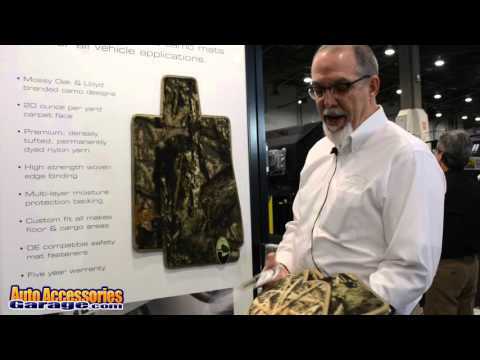 If you want to protect your vehicle’s interior and rep your outdoorsy style at the same time, the Lloyd Camo Floor Mats are just what the doctor ordered. Featuring a digitally designed pattern and a computer-cut manufacturing process, these mats are guaranteed to fit your vehicle precisely and offer maximum coverage. With fitments available for every car, truck, van, or SUV, you can choose between Mossy Oak, Shadow Grass Blades, Traditional or Digital Camo, and more. The premium continuous filament Nylon yarn of your Lloyd Camouflage Floor Mats is tufted to an incredibly dense 20 ounces per yard carpet. This provides a rich, full look and feel – much softer and more robust than lower quality OEM mats. A multi-layered backing features Polypropylene mesh, heavy latex for shape and moisture blocking water-resistance, and finally Tractionbac – a synthetic rubber that provides the ultimate in non-skid protection. Mat fasteners are fully integrated along with factory compatible retention hardware for an easy and reliable installation process. A matching cargo area or trunk liner is available for most vehicles as well. Backed by a 3-Year Limited Warranty. Nice quality car mats. Print of mats look good. An excellent addition to my Explorer. The mats are well made of decent material. They fit better than the factory mats. They were shipped & received in days... not weeks. Completely satisfied.